MoDOT values the needs of all transportation users, including pedestrians. Safe, convenient and well-designed transit and pedestrian facilities are essential to Missouri communities. Pedestrian safety needs to be considered on every MoDOT project, especially when pedestrians are expected in close proximity to roadway traffic. Existing pedestrian facilities and/or pedestrian signal indications within the project limits that do not meet current Americans with Disabilities (ADA) or MUTCD standards. Discuss what actions will be taken as part of the proposed project to make the areas compliant. Discuss any non-compliant items that are planned to remain after the project is complete and explain why these areas are not being addressed at this time. Existing gaps in the pedestrian facilities within the public right of way and how the project will address those gaps and provide improved accessibility for pedestrian users. Access to pedestrian traffic generators located near the proposed project area (i.e., residential neighborhoods, employment centers, shopping centers, schools, parks, libraries, etc.). Discuss the planned improvements and how they will provide improved pedestrian connectivity and accessibility. Accessibility for pedestrian traffic along the proposed project area where there is evidence of regular pedestrian activity such as footpaths worn on grass surfaces. Discuss how the project will provide new pedestrian facilities to meet the demands of the users. Access across a natural or man-made barrier (i.e., bridges over rivers, roadways, railroads or under access-controlled facilities). Discuss how the project will provide additional pedestrian accessibility on bridge structures. Considerations made when a local jurisdiction is implementing a comprehensive pedestrian policy in the area of the proposed project. Incorporation of pedestrian facilities where there is local support through local planning organizations or other organized community support. Accommodation of safe pedestrian passage through the Work Zone during construction of the project. Proper signing packages and detours are required when working within pedestrian areas. Where applicable, pedestrian facilities should be a topic of discussion at public meetings with a special effort made to contact local groups of non-drivers, such as the disabled community, seniors and schools. Communities and affected disability advocate groups need to be included in the planning and design process. The Missouri Governor’s Council on Disability provides a link to a Directory of Resources. This directory includes a listing of disability groups and advocates that may be contacted for input and can be searched by county. Numerous strategies are available to provide improved facilities for pedestrians. Typical roadway sections (such as 4-lane major urban roadway, 4-lane minor urban roadway and 2-lane minor urban roadway) provide typical sidewalk layouts. All pedestrian facilities are to be barrier free and usable by all people to the degree that it is technically feasible. They are to be built to the standards developed by the United States Access Board. These standards are based on the Americans with Disabilities Act of 1990 (ADA) and provided in the Americans with Disabilities Accessibilities Guidelines (ADAAG). Although not a legal standard, best practices in public right of way design are discussed more completely in the draft Public Rights of Way Accessibility Guidelinges (PROWAG). The Non-motorized Transportation Engineer in Design Division will provide additional assistance in addressing specific pedestrian and bicycling related issues for MoDOT and local program projects. The Americans with Disabilities Act of 1990 (ADA) is legislation which prohibits discrimination on the basis of disability. Other Federal laws which affect the design, construction, alteration, and operation of facilities include the Architectural Barriers Act of 1968 (ABA), and the Rehabilitation Act of 1973. These laws apply to all federally funded facilities. The ADA applies to facilities, both public (title II) and private (title III), which are not federally funded. Newly constructed and altered facilities covered by titles II and III of the ADA must be readily accessible to and usable by people with disabilities. The Department of Justice (DOJ) has rulemaking authority and enforcement responsibility for Title II, while USDOT is legally obligated to implement compliance procedures relating to transportation, including those for highways, streets, and traffic management. The FHWA Office of Civil Rights oversees the DOT requirements in these areas. Title V of the Americans with Disabilities Act of 1990 (ADA) requires the U.S. Access Board (Access Board) to issue minimum guidelines for accessible design requirements for facilities. The U.S Department of Justice (DOJ) and the U.S. Department of Transportation (DOT) use the U.S. Access Board’s guidelines as a basis to establish legally enforceable accessibility standards. The latest facility guidelines proposed by the US Access Board and approved by DOJ and DOT were published on September 15, 2010. The 2010 ADA Standards for Accessible Design (2010 ADA) is now a legally enforceable accessibility standard under the ADA. Sidewalks, street crossings, and other elements in the public right of way can pose challenges to accessibility. The DOJ's 2010 ADA Standards for Accessible Design was developed originally for buildings and sites dealing with facilities and does not clearly address all right of way applications. To address this shortcoming, the US Access Board is developing new guidelines for public rights of way that will address the various issues unique to public rights-of-way. The Board’s aim in developing these guidelines is to ensure that access for persons with disabilities is provided wherever a pedestrian way is newly built or altered, and that the same degree of convenience, connection, and safety afforded the public generally is available to pedestrians with disabilities. "The Draft Guidelines are not standards until adopted by the U.S. Department of Justice and the U.S. Department of Transportation. The present standards to be followed are the ADA Accessibility Guidelines (ADAAG) standards. However, the Draft Guidelines are the currently recommended best practices, and can be considered the state of the practice that could be followed for areas not fully addressed by the present ADAAG standards. Further, the Draft Guidelines are consistent with the ADA's requirement that all new facilities (and altered facilities to the maximum extent feasible) be designed and constructed to be accessible to and useable by people with disabilities." The guidelines provided in MoDOT standards are based upon the federal requirements contained in the 2010 ADA Standards for Accessible Design, based on ADAAG. Exceptions will be where the federal standards do not provide specific ADA accessibility aspects/requirements. In those cases, guidelines and best practices will be used based on the proposed PROWAG or other available FHWA guidelines. Where applicable, best practice references will be specifically cited in the guidelines. The Manual on Uniform Traffic Control Devices has been developed with the cooperation of the Access Board and can be considered the standard for traffic control regulations. Part 4, Chapter 4E specifically addresses traffic signals and Part 6, Chapter 6D addresses work zones. Other sections include pedestrian considerations as needed. The ADA requires that public entities with more than 50 employees conduct a self-evaluation and develop a transition plan that identifies all structural modifications necessary to achieve program accessibility. Between 2007 and 2010, MoDOT developed such a plan and accepted an anticipated compliance date of 2027. As such, all MoDOT projects will address existing ADA Transition Plan items within the project limits in an effort to bring them into compliance with ADA Standards and Guidelines to the maximum extent feasible. All existing MoDOT facilities that are not currently compliant with ADA standards must be included in MoDOT’s Transition Plan. Whether a project is considered new construction, an alteration or maintenance to an existing facility is important in determining how the Americans with Disabilities Act applies. However, it is MoDOT’s policy to upgrade pedestrian accommodations on all projects, including maintenance projects, when and where it is possible and appropriate. These upgrades may occur as stand-alone projects, maintenance, operations or contract projects. Pedestrian facilities are to be considered in all new construction projects and are to be planned, designed, constructed and maintained in a barrier-free, ADA-compliant manner. No new facility may be opened with a non-compliant ADA feature. Much of the work done by MoDOT is upgrading or altering the existing system. In accordance with ADA, when an alteration is made to a roadway on which pedestrian facilities (sidewalks, pedestrian grade separations, curb ramps, etc.) exist on Missouri Highways and Transportation Commission (MHTC) right of way, each altered element or space within the limits or scope of the project shall comply with the applicable requirements for new construction to the maximum extent feasible. Project budgets must take into account the necessary work required to improve facilities to ADA compliance. A change that affects or could affect the usability of all or part of a building or facility. Alterations of streets, roads, or highways include activities such as reconstruction, rehabilitation, resurfacing, widening, and projects of similar scale and effect. Resurfacing of any thickness constitutes an alteration under the ADA and triggers, at minimum, the obligation to provide ADA compliant curb ramps where pedestrian walkways intersect the resurfaced streets. Examples include, but are not limited to the following treatments or their equivalents: addition of a new layer of asphalt, reconstruction, concrete pavement rehabilitation and reconstruction, open-graded surface course, micro-surfacing and thin lift overlays, cape seals, and in-place asphalt recycling. 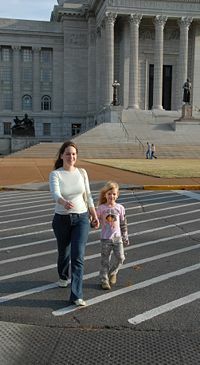 Generally, curb ramps are needed wherever a sidewalk or other pedestrian walkway crosses a curb. Curb ramps must be located to ensure a person with a mobility disability can travel from a sidewalk on one side of the street, over or through any curbs or traffic islands, to the sidewalk on the other side of the street. Detectable warning devices will be installed at all curb ramp or slope area interfaces with public roads, streets, alleys or highways. Detectable warning devices will also be installed at approaches where a traffic control device like a stop sign or a yield sign is installed. The installation of ramps or curb ramps is not required in the absence of a pedestrian walkway with a prepared surface for pedestrian use. Curb ramps are not required in the absence of a curb, elevation, or other barrier between the street and the walkway. If pedestrian facilities exist before a project, that same space must remain and be accessible to the maximum extent feasible. The phrase "to the maximum extent feasible" applies to the occasional case where the nature of an existing facility makes it virtually impossible to comply fully with applicable accessibility standards through a planned alteration. In these circumstances, the alteration shall provide the maximum physical accessibility feasible. Any altered features of the facility that can be made accessible shall be made accessible. All barriers to access between curb ramps, steep cross slopes, or steep running sloped areas will be addressed so that the area is passable to users of all abilities including those that use assistive mobility devices. All existing pedestrian facilities disturbed by highway construction will be replaced and made ADA-compliant to the maximum extent feasible. Signal projects should be scoped to include curb ramps and/or island cut through, detectable warnings, and ADA-compliant pushbuttons at a minimum. Upgrading intersections to full ADA compliance to expedite completion of MoDOT’s Transition Plan. This should include providing audible pedestrian signals anywhere there are existing pedestrian signal indications. Any exceptions will be based on technical infeasibility. Documentation of the decision shall be accomplished by way of design exception and will be discussed in the project scoping documentation. This work must be accomplished as part of the alteration project, or by seperate project or maintenance that completes simultaneously with the alteration. Basic maintenance tasks do not, under federal law, require bringing adjacent facilities up to current standards, but do require any disturbed areas to be replaced with complaint items to the maximum extent feasible. As previously stated, however, it is MoDOT’s policy to upgrade pedestrian accommodations on maintenance projects, when and where it is feasible and appropriate. In so doing, additional progress can be made toward executing the transition plan. Treatments that serve solely to seal and protect the road surface, improve friction, and control splash and spray are considered to be maintenance because they do not significantly affect the public's access to or usability of the road. Some examples of the types of treatments that would normally be considered maintenance are: painting or striping lanes, crack filling and sealing, surface sealing, chip seals, slurry seals, fog seals, scrub sealing, joint crack seals, joint repairs, dowel bar retrofit, spot high-friction treatments, diamond grinding, and pavement patching. In some cases, the combination of several maintenance treatments occurring at or near the same time may qualify as an alteration and would trigger the obligation to provide curb ramps. Requests for improvements to pedestrian facilities often come from the public involvement efforts associated with larger projects. Requests from the public for improved accessibility, removal of existing barriers to access or to make an intersection ADA compliant will be addressed on a case-by-case basis at the earliest opportunity. These upgrades may occur as stand-alone projects for either maintenance, operations or as part of the current project. For off-system projects and MoDOT permitted construction, the department, during its initial meeting or discussion with the owner or owner representative of the project will identify or restate the ADA obligations for the project. Written notice of areas of noncompliance found beyond MoDOT right of way should be provided to the owner. Work necessary to bring these items into ADA compliance should be included in off-system projects and on permitted projects on right of way. 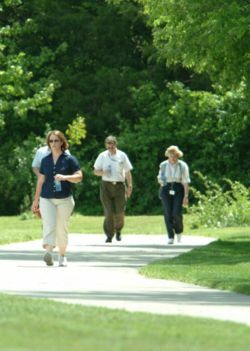 Costs for new pedestrian facilities, including right of way, construction and maintenance, should be included in the regular project costs, but may also be funded in partnership with local jurisdictions or by local jurisdictions alone, by Enhancement or Safe Routes to School funds, other non-department sources or any combination of these. Existing pedestrian facilities disturbed by any MoDOT improvement will be replaced to meet current design standards to the maximum extent feasible. Normal right of way and construction costs for this work will be included as a project cost for the proposed improvement. Agreements with local jurisdictions or others will be used to address funding and maintenance issues for pedestrian facilities constructed on or off of MHTC right of way. Standard form agreements are available on the Chief Counsel's contract webpage. Detailed information concerning the sequence for preparing and executing a project agreement is available in EPG 235.2.3 Project Agreements. The agency responsible for maintenance will be established prior to construction. MoDOT assumes legal liability for pedestrian facilities on MHTC right of way unless this responsibility is addressed by agreement, with MoDOT personnel performing regular inspections to ensure proper maintenance is performed as provided under terms of the agreement. If maintenance is not performed as required by agreement, MoDOT will take necessary steps to ensure proper maintenance is provided with the cost borne in accordance with the agreement. Maintenance of vegetation along sidewalk is required by ADA policies and necessary to keep the space open and available to pedestrians. Pedestrian facilities, to include sidewalks and steps, will be maintained by MoDOT where it is an obligation of the department. Maintenance agreements shall be consulted to determine if there is another agency that has agreed to maintain or has been delegated maintenance of certain areas of MoDOT's property. Where such delegation has not been specified, adjacent property owners may be required to maintain the walks based on local ordinance, even though the pedestrian facility may be on MoDOT right of way or on the right of way of a dedicated street. In some cases, MoDOT may have only have a pavement surface maintenance obligation and the actual property may be owned by another local agency. In these cases, MoDOT should contact the agency to notify them of any needed ADA work along the corridor triggered by MoDOT resurfacing work. Area Engineers should be MoDOT staff to contact the local agency and to discuss the local agencies responsibility for ADA improvements that will be triggered by the MoDOT surfacing work. Where there are no agreements with other agencies or local ordinances that delegate maintenance responsibilities for pedestrian facilities, MoDOT shall maintain pedestrian facilities in compliance with current ADA standards and guidelines through maintenance activities, permitted work on right of way or through contracted efforts. MoDOT is ultimately responsible for the maintenance and accessibility of any pedestrian facility located within right of way. Existing sidewalks shall be maintained within the project limits and are not allowed to be removed. ADA provisions state that projects shall not decrease, or have the effect of decreasing, the accessibility of a facility below the requirements for new construction in effect at the time of the alteration (PROWAG R202.3.1). Articles in "642 Pedestrian Facilities"
This page was last modified on 7 April 2017, at 13:52.